от 4000 шт. — 14.70 руб. от 8000 шт. — 14.30 руб. 76 руб. 6735 шт. 2-3 недели 5 шт. 5 шт. 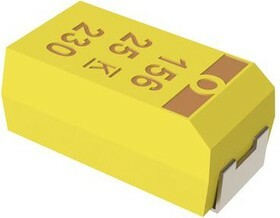 The T494 series SMD Tantalum Capacitor specifically designed for highly automated surface mount processes and equipment. This product meets or exceeds the requirements of EIA standard 535BAAC. The standard terminations are available in 100% matte tin and provide excellent wetting characteristics and compatibility with today's surface mount solder systems. Tin/lead (Sn/Pb) terminations are available for any part number. Gold-plated terminations are also available for use with conductive epoxy attachment processes.